Three days worth of disappointment later, the Washington Nationals woke up their bats. The Chicago Cubs came into Washington a day after losing their Manager Lou Pinella to early retirement during an already abysmal season and still managed to sweep the Nats by outscoring them 18-5 in a three-game series. So instead of taking batting practice on the diamond before the series opener against the second place St. Louis Cardinals, Manager Jim Riggleman shook things up a bit and moved the team’s batting practice inside. What seemed to be a last minute moral boost managed to deliver some results. Washington strung together ten hits against Cardinals starter Chris Carpenter to match his season high of hits by the opposition against him in a start. But by the end of the night, Jordan Zimmermann’s sub-par debut performance was a mere blip in a 13 inning game that felt like it would never end. Zimmermann’s four inning outing included giving up seven hits and five earned runs while walking a batter, striking out four and giving up Albert Pujos’ 400 career home run. The Pujos home run in the fourth inning was the start of a four run rally. 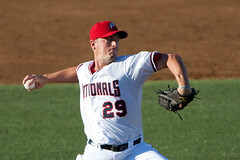 Riggleman allowed Zimmermann to complete the inning before sending Craig Stammen in for the fifth and wasn’t disappointed to his 2010 debut appearance. Stammen and Peralta held St. Louis giving the Nats an opportunity to use their newly juiced bats, which they did in the sixth, to take the lead. But then, for the second time in two nights, the bullpen ruined a better than usual outing for their team. Washington maintained the lead until the ninth inning when Drew Storen blew a save opportunity and gave up two runs. What looked like another loss in a pathetic offensive homestand got a breath of fresh air thanks to a two-run blast off the bat of Roger Bernadina in the bottom of the ninth which took it into extras. St. Louis and Washington kept the back and forth tension of extra innings going until each side had used up all their position players available. 22 players took the field for the Nats off their 25 man roster, the entire bullpen pitched, and somehow – after all of this – the Nats managed to win it in the thirteenth. Center fielder Nyjer Morgan got hit by a pitch from Blake Hawksworth and then back-to-back singles from Alberto Gonzalez and Ian Desmond brought Morgan around to score the final run of the night for an 11-10 victory.